An artistic high as we paint mountains and monasteries in the Himalayan kingdom of Bhutan, snow capped mountains above us! We arrive in Delhi where we will explore before journeying onwards into Assam and Kaziranga National Park, then to the Kingdom of Bhutan, arriving in the tiny capital Thimpu. 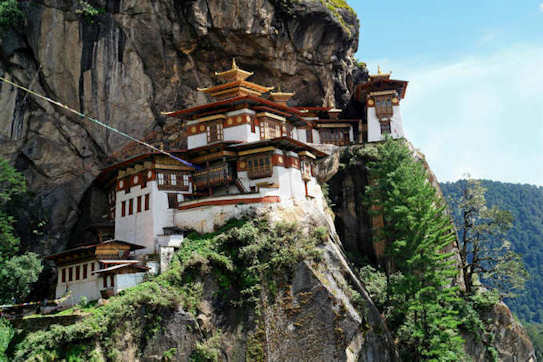 Here we discover Bhutanese lifestyle, culture and traditions. The Buddhist faith permeates secular life, there is a reverence for the land and its well being. Spectacular scenery awaits us, rugged Himalayan mountains, ancient monasteries, hilltop temples, rivers, forests of pine and cedar, fertile valleys and sacred lakes. This is a seldom visited country and we are privileged to be able to travel there. As we visit Paro, Punakha, Trongsa, and Bumthang, our sketchbooks will become journals, dotted with monasteries, brightly coloured prayer flags and splashes of ‘monks robe-red’. This itinerary also takes us to Kaziranga National Park in North East India, a vast expanse of grass lands, marshes and tropical forests. There are good chances of seeing tiger here, though one of the joys of Kaziranga are the herds of wild elephant and the massive armour-plated Asian rhino. From the banks of the Brahmaputra River to the dense forests of Mikir Hills Kaziranga is home to barasingha (swamp deer), wild sloth bear, elusive tigers and some of India’s largest mammals, one-horned rhino, Asian elephant and Asiatic wild buffalo. With crested serpent eagle, Pella’s fishing eagle and grey headed fishing eagle, wading birds, seven different resident kingfishers, woodpeckers, colourful parakeets and bee-eaters we have entered a birdwatchers paradise. Finally we return to the colour, bustle and vibrancy of Delhi, exploring the old walled part of the city, visiting the Red Fort and Humayun’s tomb.